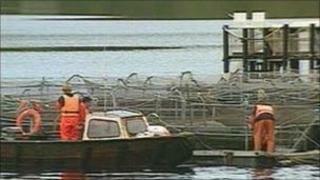 A leading player in the Scottish salmon industry has abruptly replaced its chairman and chief executive. The clear-out of the former team in charge of the Scottish Salmon Company is being described as a move from a restructuring phase to one of growth. It follows the sudden replacement of a previous chief executive earlier this year. Outgoing chairman Jim Mullins left with immediate effect on Friday, as did his chief executive Mike Corbett. Mr Corbett was a former NHS manager who joined the company earlier this year. A spokesman denied the move had been a boardroom coup. The Scottish Salmon Company has about a fifth of Scottish farmed production, at 24,000 tonnes per year. It employs 350 staff at more than 40 sites on the west coast and the Hebrides. Last year, it had turnover of £63m, and pre-tax profits of £10.5m. It faced "severe liquidity problems" two years ago, when it was named Lighthouse Caledonia, but secured new funding and overhauled its board in May last year. The company changed its name earlier this year, with a share exchange offer. It is listed on the junior stock market in Oslo while registered in Jersey. Its new chairman, Robert M Brown III, is an American who was managing director of Lehman Brothers bank for 16 years to 1994, and has expertise in Russian investment banking. Aged 63, he joined the board of the Scottish Salmon Company two months ago. While the board sees him as bringing investment expertise in the chairman's role, the new chief executive, Bill Hazeldean and the new chief operating officer, Stewart McLelland, have experience in seafood and retail. Commenting on his appointment, Mr Brown stated: "Jim Mullins has a successful history of building businesses and he has again demonstrated his leadership as chairman of The Scottish Salmon Company. "It is both an honour for me to succeed him and a challenge to lead the company onward." Is GM salmon swimming against the tide?